William Faulkner's Home Illustrates His Impact On The South Melissa Block visits William Faulkner's home: Rowan Oak, in Oxford, Miss. She talks with curator William Griffith about Faulkner's running theme of the South in conflict with itself. Rowan Oak, William Faulkner's home in Oxford, Miss. Producer Elissa Nadworny and I lingered outside, looking way up at the towering cedar trees that line the walkway to the pillared entrance. We were skulking around when the front door burst open and curator William Griffith spotted us. "Well, c'mon in!" he called. And in we went. Griffith explained that Faulkner gave Rowan Oak its name from two trees: the Rowan tree and the live oak. According to Scottish legend, the Rowan tree is supposed to keep out evil spirits: "like reportahs and the taxman!" Griffith drawled, emulating Faulkner's southern accent. The live oak was to symbolize strength and solitude. But neither tree is actually on the property. "When I took over at Rowan Oak, I spent three days looking for the Rowan Oak. No one told me!" Griffith said. 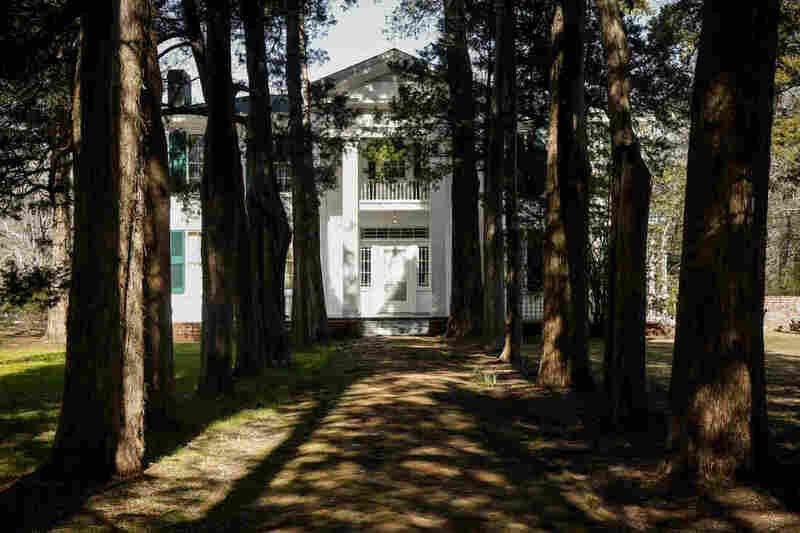 The house was built in 1844, and when Faulkner bought it, it had been abandoned for seven years. "No one wanted to buy it," Griffith said. "This house had no modern conveniences, not even running water." But Faulkner loved the property and decided to restore it and make it his home. He lived at Rowan Oak until his death in 1962. His funeral service was held in the parlor. The library was originally Faulkner's writing room, and his glasses are perched there on a table, as if he'd just set them down for a minute to go make some coffee. Faulkner wrote anywhere, Griffith told us: "Inside, outside, on trains, on airplanes, in cars. Nothing stood in his way. Not ailment, weather, anything. When he had an idea, he worked 'til it was finished." We walked down a narrow hallway, past the telephone where Faulkner got the call in 1949 that he had won the Nobel Prize. He and other family members scribbled phone numbers on the wall in pencil, right above the phone. In the back of the house is the office that Faulkner added on after he won the Nobel. 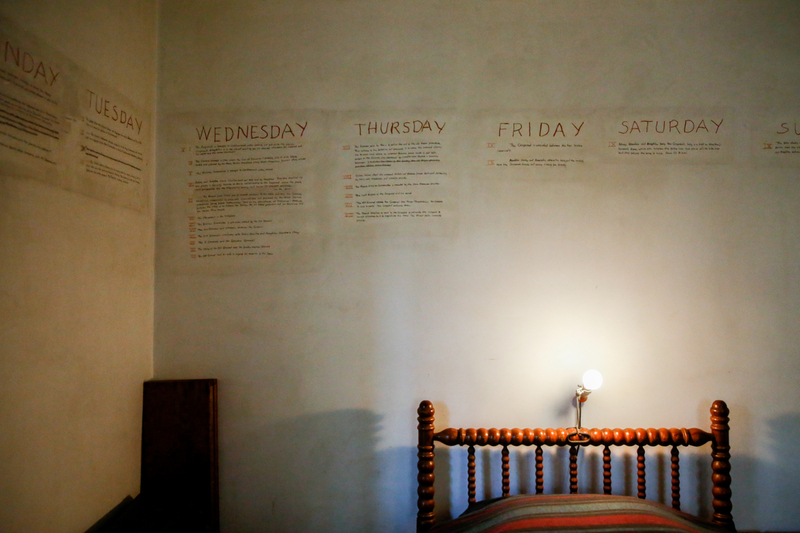 On two walls, he sketched out chapters for his novel, A Fable, in graphite and red grease pencils. The story goes that he had taped pages of the plot outline up on the walls but when his big silver fan blew the pages away, he just decided he'd write directly on the walls themselves. On two walls in his back office, Faulkner sketched out chapters for his novel, A Fable, in graphite and red grease pencils. 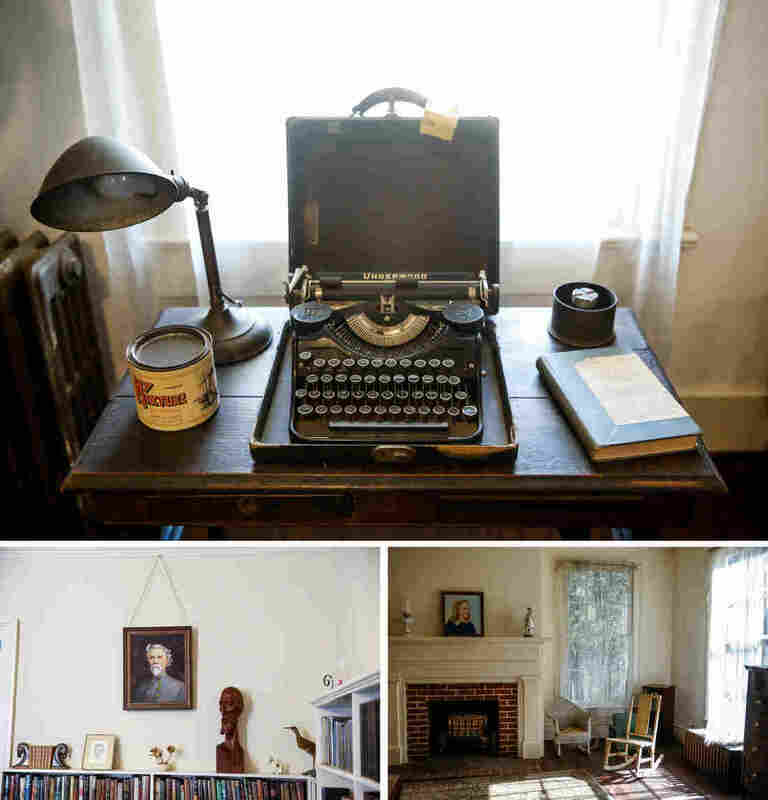 Faulkner's portable Underwood typewriter is there in the study, on a small table given to him by his mother. Sometimes, he would take the setup outside, so he could write outdoors. My favorite item in the study: the rusted can of Scram Dog Repellent, which, according to Griffith, Faulkner would use to keep dogs away from his prized climbing roses. One of Faulkner's most famous lines comes from his novel Requiem for a Nun, published in 1951: "The past is never dead. It's not even past." That quotation strikes me as especially apt as a theme for our series "Our Land." We've been exploring how place and history shape a community's identity, and Faulkner certainly wrestled with that throughout his writing. "Major themes of his work were a South in conflict with itself," Griffith explained. "Still dedicated and devoted to those old ways, but knowing that things have to change. And they need to change. Faulkner thought that his generation was the one to restore the South, by embracing change, and opening their minds and hearts to a new South. He didn't want it to change overnight. He often talked about the slow change." 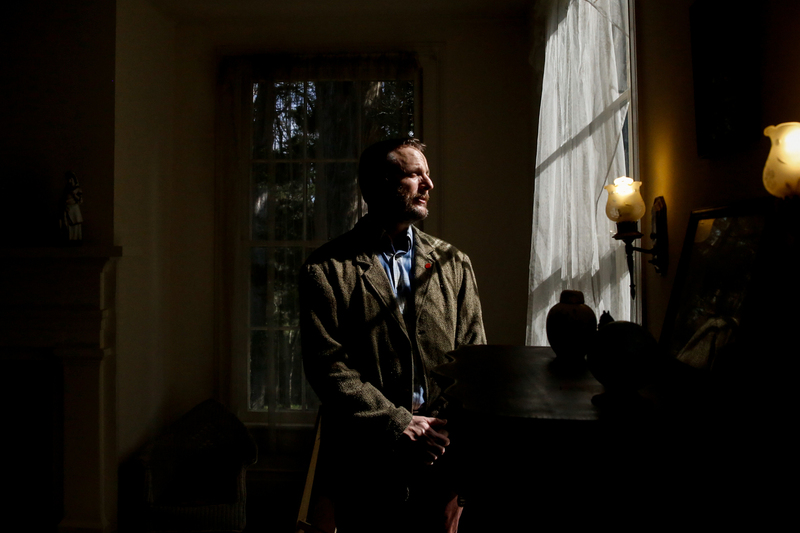 William Griffith, curator of Rowan Oak, poses for a portrait in an upstairs bedroom. How does that apply to the South or to Mississippi today, I asked? Griffith paused to think. "Jeez," he started. "Mississippi has changed for the better. There's no doubt about it." But, he continued, "We still have work to do. One reason Faulkner's literature is still relevant today is 'cause he wrote about those things that we'll never really solve. Y'know, we'll never, ever solve all of the problems that Mississippi faces. But the important thing is to keep working at it. To be aware of these issues and keep working at it." Earlier, I had found another quote attributed to Faulkner that seemed perfect to fold into our series: "To understand the world, you must first understand a place like Mississippi." What a great opening line that would be! But as I read further, I learned that in fact, Faulkner never wrote those words. When I mentioned the false attribution to Griffith, he laughed: "I bet he wished he would have said that! Faulkner said that writers were thieves. They were all magpies. They'll steal from anybody, even an old lady." Griffith left us with one final thought about the job that he has, tending to the beautiful home of one of America's greatest 20th-century writers. "I'm going to be honest with you," he said. "William Faulkner would hate this. He would hate every bit of it. He was a very private man. And I really feel badly that I'm doing something he would have hated. He would hate it, talking about him on the radio." So at Rowan Oak, they don't tell any family secrets, Griffith explained; instead, the focus is on literature and the history of the property. No gift shop, no bobblehead dolls? "No gift shop. No china paintings. No t-shirts. No anything like that."